You can now get a greater insight into your child’s progress whilst swimming with the school. 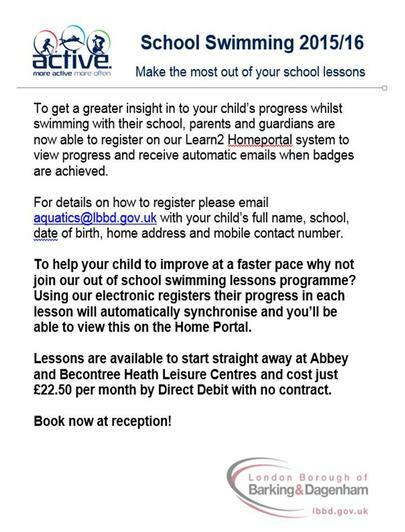 Parents and guardians can register on the Learn2 Homeportal system to view their child's swimming progress. For details on how to register please email aquatics@lbbd.gov.uk with your child’s full name, school, date of birth, home address and mobile contact number. You may also want to consider signing up for out of school swimming lessons. These cost £22.50 per month and progress can also be viewed on the Home Portal. More details are shown in the attached flyer.